Baby, it's cold outside. Well, chilly, at least. So what are you gonna do about it? One of the most human ways to deal with the elements is to find food and shelter. 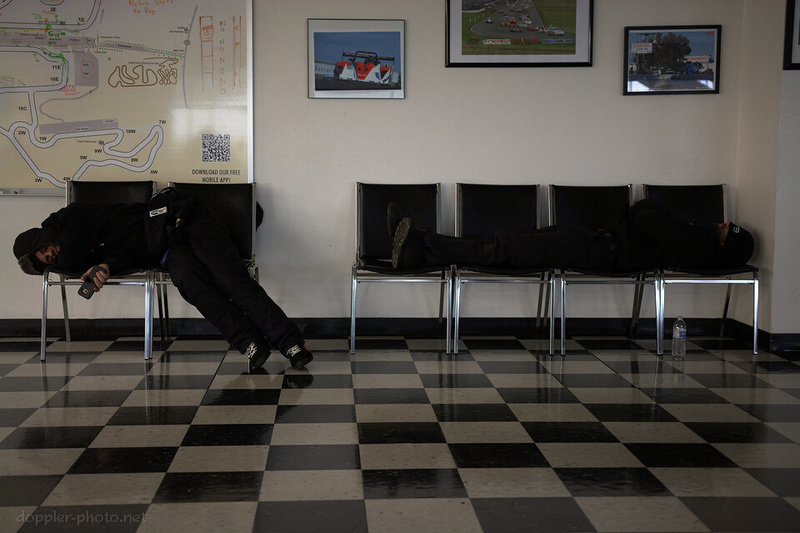 At the 25 Hours of Thunderhill, you can find both at the Thunderhill Grill. The Grill is run by Jim Thompson, along with a cast of staff that includes permanent employees, as well as some who specifically help out during the 25. 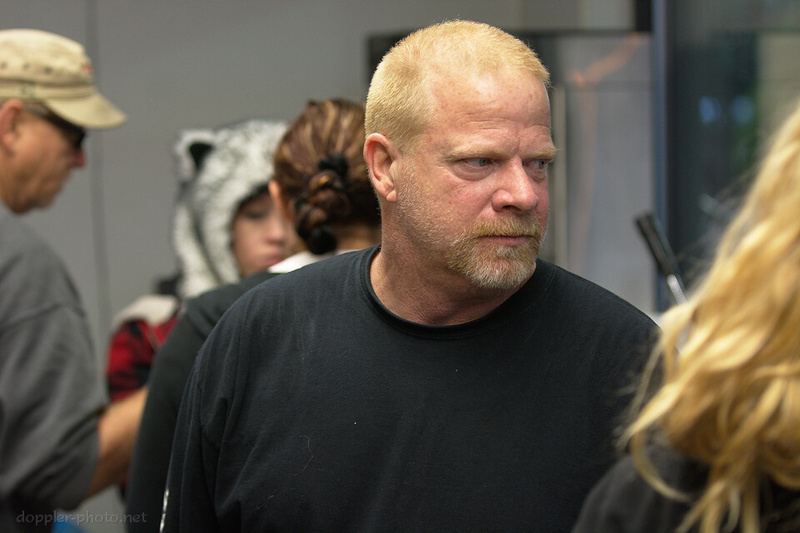 Jim serves as one of the chefs, and as the general manager of the business. I'm grateful to Jim and the rest of the staff for allowing me to document the hustle and bustle inside the Grill during their morning rush, at around 7:30 a.m. on Sunday morning. 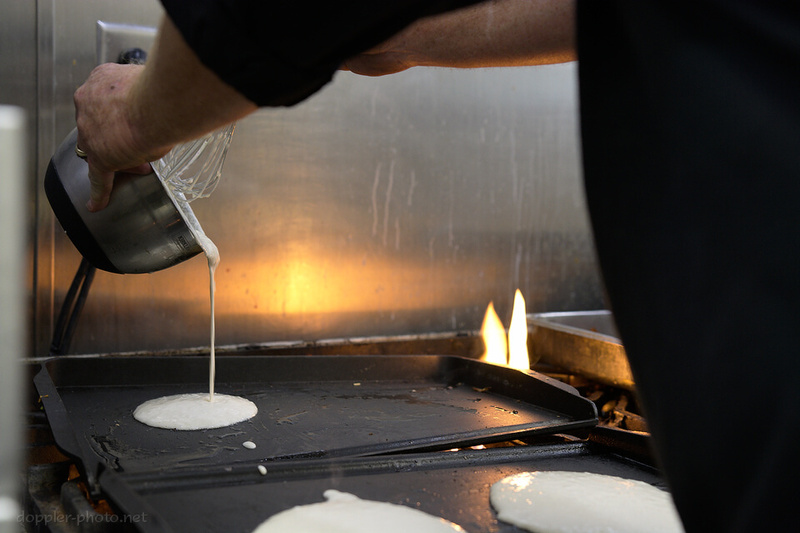 The kitchen opens Saturday morning, and doesn't close until well after the checker drops on Sunday. One of the things that feels so comforting about it is that constancy: regardless of the time, regardless of the weather, they've got you covered. The face of the Grill has two windows: walk-up orders go in on the left side, and food comes out on the right. 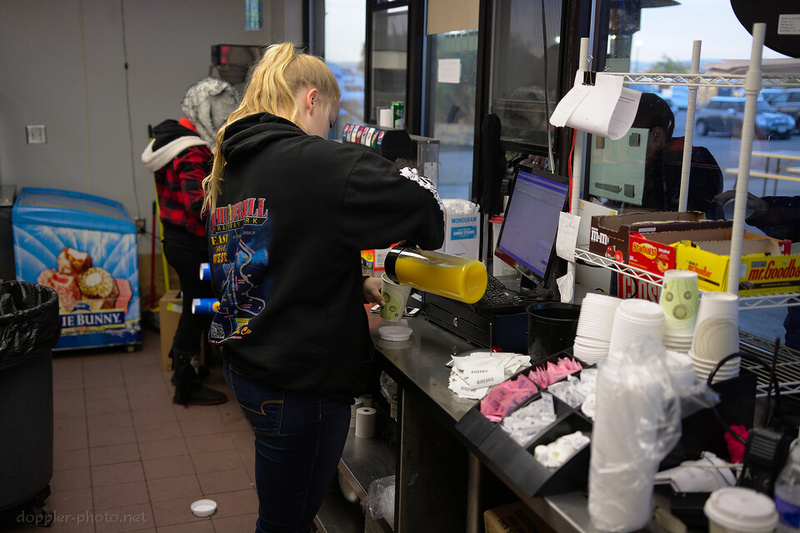 On the opposite side of those windows, the staff tries to keep the orders straight, get them served quickly, and keep on top of other tasks (like refilling coffee and condiments, and packaging single-serving items, such as muffins) when they can. Typically, beverage orders are served immediately. In the photo, Hannah (near) pours a cup of orange juice for a customer as Jeska (far) prepares single servings of salsa to go with the ever-popular breakfast burritos. The Grill also offers catering for interested race teams, including breakfast, lunch, dinner, and snacks during the day and overnight. 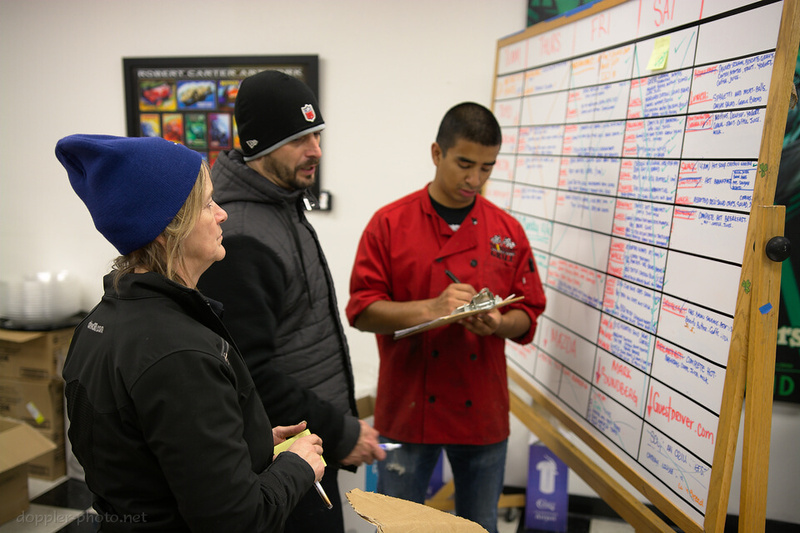 Here, (left to right) Stacey, Francisco, and Sam plan the upcoming deliveries based on a meal schedule that they kept on a large whiteboard. 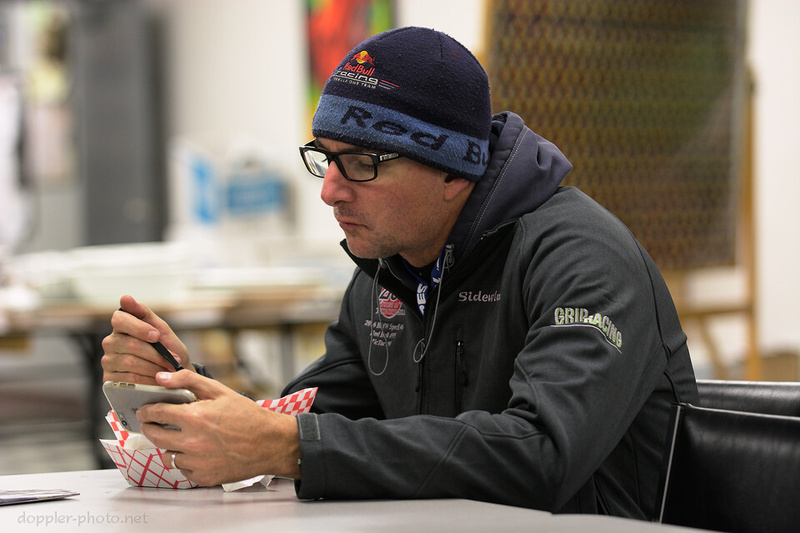 When the food is ready to go out the door, the team shuffles it into the back of a minivan, which they drive around the paddock to make deliveries. Here, Francisco stands back as Sam rolls a cart full of catering trays toward the minivan. In the background, chefs (left to right) Dale, Jim, and Gerónimo work in the kitchen. And finally, the deliveries. 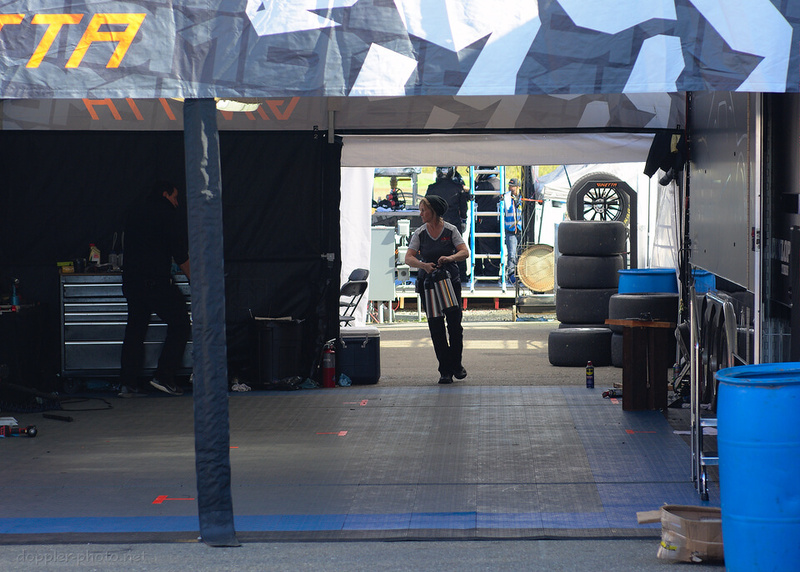 Here, Stacey walks toward the exit of the Ryno Racing camp after swapping out some carafes of coffee. 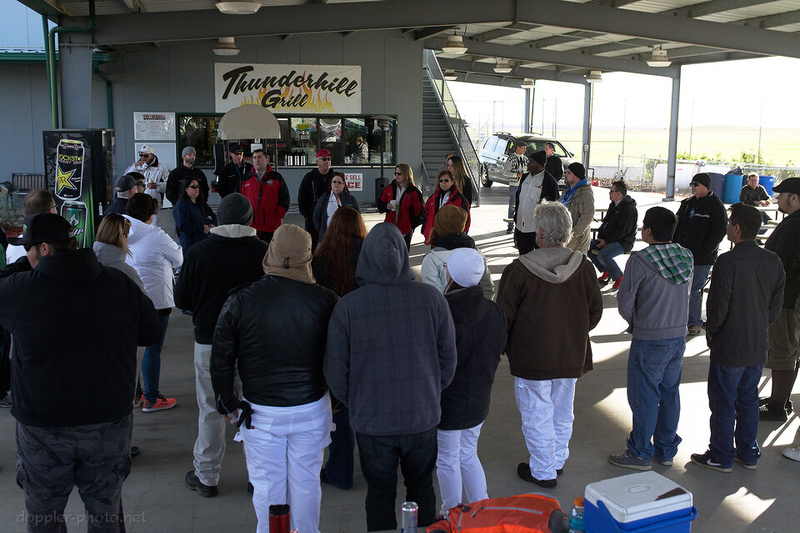 Thunderhill Grill itself is a permanent fixture within the Clubhouse building. The building also features a huge metal awning out front with picnic seating, as well as a large indoor room with tables and couches. 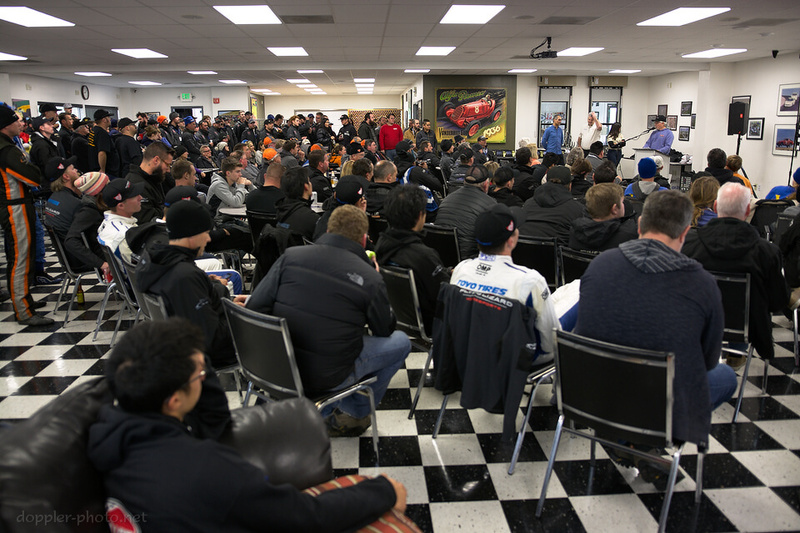 Every race, the building becomes an oft-frequented meeting place and hangout for race fans, teams, and staff alike. You can get food and find respite from the beating sun, the driving rain, the frigid cold, or whatever other combination might be at hand. The indoor area also provides WiFi Internet connectivity, as well as some insulation from the ever-present drone of the racecars. In the photo, a driver for the Grip Racing team has a quick dinner Saturday evening while sharing a video chat with his family. It's also a comfortable (well… relatively…) place to catch some shut-eye when time allows. Here, Angelo (left) and Tony catch up on some sleep after their #12 TFB Praga retired overnight with a second blown engine. And when the race finally ends and the positions are tallied, it's where the teams come together one more time to celebrate the ones who triumphed, and to acknowledge the folks who helped make the race possible. Next time, we'll take a closer look at one of the fundamental components that make race cars possible: tires. For now, if you know other people who'd appreciate this post, show it to them! Share with friends, and don't forget to subscribe for more.